NetEnt opened their first office in Stockholm back in 1996, with only 3 employees and 1 customer to work with. They were basically one of the pioneers of the online gaming industry, but it wasn’t all peaches for the first few years. 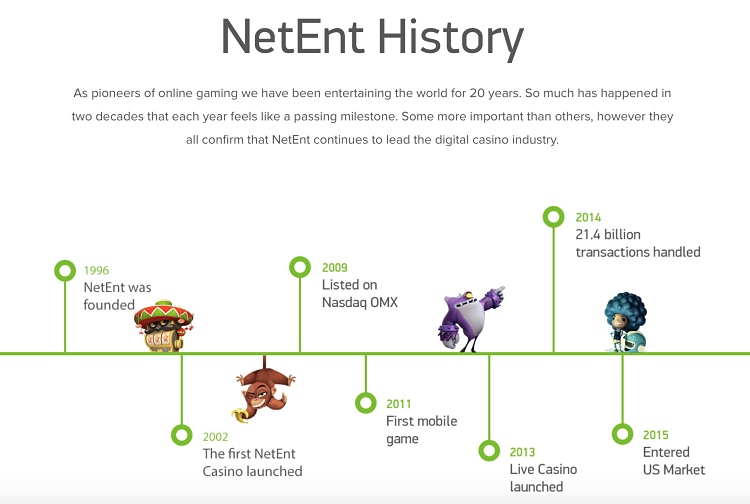 In 2001 things finally started to look up; in 2002 the first NetEnt casino was launched, in 2009 they got listed on Nasdaq, and in 2011 they have created their first mobile game. The culturally diverse company has a presence in Sweden, Malta, Ukraine, Gibraltar, USA and Poland, all their employees (more than 900 of them) sharing a passion “for delivering the very best in gaming”. Industry acknowledgments such as a triple win at the EGR Awards 2015 (Slot Provider of the Year, Innovation in Mobile, Mobile Supplier of the Year), and 2017 Casino Content Supplier of the Year at EGR Nordics, give credence to the company’s slogan: “Better Gaming Begins Right Here”. NetEnt is licensed in a number of jurisdictions, namely the UK, Alderney, Malta, Gibraltar, Belgium, Spain, Romania and New Jersey. The company also holds the eCOGRA Safe & Fair seal of approval and the GLI certificate, while the fairness of their games is continuously tested and certified by iTech Labs. Check out the list of leading NetEnt casinos where you can play games from one of the industry’s pioneers. NetEnt boasts one of the most complete gaming offerings on the market today. Like with many others, the majority of their games are slots, but they cater fairly well to fans of table games and Live gaming enthusiasts. Their games are played using Flash technology (no downloads, thank you very much), while a mobile gambling platform called NetEnt Touch™ works wonders on iOS and Android mobile devices. Probably the most famous slot on the planet, Starburst, comes out of NetEnt factory, along with Bloodsuckers, Gonzo’s Quest, Jack Hammer, Spinata Grande, and more recently released Guns ‘n’ Roses and Fairytale Legends. NetEnt progressive games, such as Mega Fortune and Arabian Nights, feature some of the industry’s biggest pooled jackpots. You’ll currently be able to play about 120 of NetEnt video and classic slots and enjoy impressive visuals, animations and sounds, and all the features you’d expect to find plus a number of those you wouldn’t. While clearly focused on slots, NetEnt’s catalogue additionally contains 20+ table games such as French, European and American Roulette, Classic and Double Exposure Blackjack, Pontoon, Baccarat and Punto Banco, Caribbean Stud, Casino Hold’em, Oasis, Let It Ride and Trey Poker, and finally HiLo Switch and Red Dog. On top of everything mentioned above, one of the most recognised names in the industry is behind about dozen Video Pokers, including Joker Wild Double, Classic Deuces Wild and Jack or Better, a good selection of Scratch Cards, plus an odd Bingo, Keno and virtual game. A relative late entry into live online gaming (they’ve joined only in 2013) means there’s some catching up to do in terms of number of products available. Games are developed in collaboration with actual players, user-friendly interface makes them easy to play, and professional and well-trained dealers will be happy to chat live and provide assistance if needed. The portfolio currently includes Live French and European Roulette, available on desktop and mobile, Low and High limit Live Blackjack, and Live Common Draw Blackjack. NetEnt is super-focused on innovations, and one way they foster and demonstrate it is via The Challenge. In their own words, “The Challenge is NetEnt’s web series where four of their colleagues put their culture and values to the test by climbing a mountain in the Alps – with no experience”. While introducing us to The Challenge, the company shares insights about how their employees work with each other across the borders, and how they develop their creative streaks. Teamwork and innovation are the key words, “Better Mondays – Better Gaming” the slogan, and The Challenge a way to let the world know what it’s like to work in NetEnt. Watch the videos on the company’s website and you might start thinking about a career change (thankfully, while Casino Bloke loves what this company stands for, he’s already experiencing fantastic Mondays and is not about to bolt)!